Still a classic! Peter Rabbit is still as cute today, as he when he was introduced in 1902. 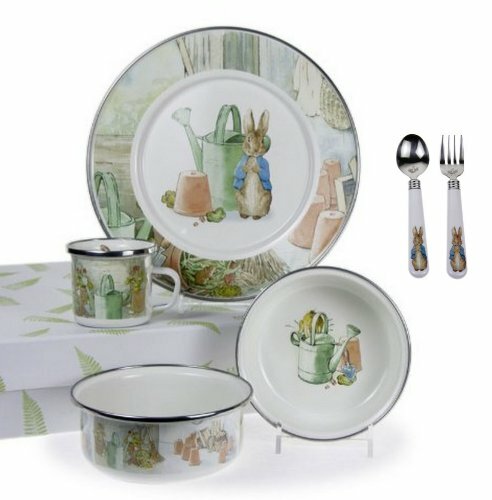 Adorable Peter Rabbit scene with the potting shed scene and watering can. Great set for a boy or girl! This 4 piece set is made with durable enamelware (except for flatware). What's enamelware and why is it so great? The design is baked into the metal of this set. One can cut on the surface and it won't scratch or ruin the design. You could even bake with it! The plate, bowl, and cup are made with enamelware. The lid for the bowl is plastic and not to be used in the oven. Also included are a flatware set that's sized for those little hands. Stainless steel fork and spoon have plastic handles and coordinate with the feeding set. This entire bundle is built for day to day use, and it's also dishwasher safe. Happy eating! If you have any questions about this product by Golden Rabbit, contact us by completing and submitting the form below. If you are looking for a specif part number, please include it with your message.